NC Government & Heritage Library, 2017, 2018. The General Assembly of 2001 named the Scuppernong grape as the official State Fruit (Session laws, 2001, c. 488). The same session law declared the strawberry and blueberry to be the state berries. 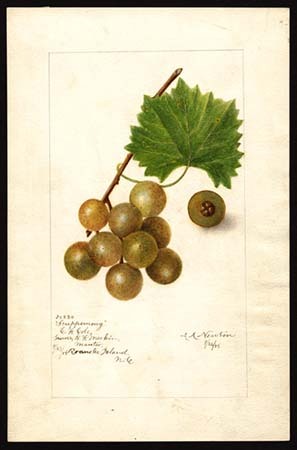 The Scuppernong (vitis rotundifolia) is a variety of muscadine grape, and has the distinction of being the first grape ever actively cultivated in the United States. It was named for the Scuppernong River, which runs from Washington County to the Albemarle Sound. Giovanni de Verrazano noticed this variety as far back as 1524, and explorers for Sir Walter Raleigh (or Ralegh, as it's sometimes spelled) in the 1580's sent back reports from the Outer Banks of grape vines that "…covered every shrub and climbed the tops of high cedars. In all the world, a similar abundance was not to be found." The Roanoke colonists are credited with discovering the Scuppernong "Mother Vineyard," a vine that is now over 400 years old and covers half an acre. Because of the Scuppernong, North Carolina was first in the country in wine production through the 19th century. Today, the scuppernong is used in jams, jellies, and wine. In 2016, North Carolina was ranked 11th in total state grape production. Newton, Amanda Alimira. [Illustration.] 1905. U.S. Department of Agriculture Pomological Watercolor Collection. Rare and Special Collections, National Agricultural Library, Beltsville, M.D. https://usdawatercolors.nal.usda.gov/pom/catalog.xhtml?id=POM00006084 (accessed June 14, 2017). I LOVE this website! I have a project due September 11 and I'm already done thanks to this website! THANK YOU!!!!!!!!! maybe we should add more info? Thanks for visiting this article! What type of additional information would you like to see here? Please let us know and we will look into updating the article. Feel free to post a reply back here with your ideas. I want to purchase scuppernong grapes and have them sent to me in Minnesota. What website can ordering the fruit, not the vine, be found? I'm from South Carolina and I cannot locate them in Minnesota.